Three 5150 races in South Africa in 2018 and three wins for Annah Watkinson. The 36-year-old CFA (Certified Financial Analyst) was unstoppable in Bela Bela (4 August), Ekhurleni (21 October) and in Nelson Mandela Bay (25 November). The win in Nelson Mandela Bay capped an eventful year for Annah. 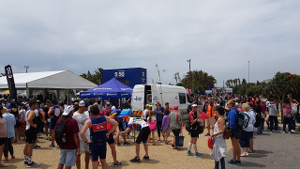 Over and above the three 5150 victories, Annah was also on the top rung of the podium at the Miway Life Durban Ultra in March and was 21st at the IRONMAN 70.3 World Championships in Nelson Mandela Bay on 1 September. Annah was a “late bloomer”, only starting running in 2008, before migrating to the triathlon in 2011. A year later she won the age group category at the East London 70.3 and finished top overall in the woman’s race which earned her a place in the 70.3 World Championships in the USA. In 2013 Annah won her age group category at the full Ironman in Port Elizabeth, earning her a place at the World Championships in Kona that year. She felt she was not quite ready for that level yet, and instead represented South Africa at the 2013 ITU World Long Distance Championships. 2014 started off well for Annah, winning her age category at Ironman South Africa, booking her place in Kona again. This time she was going. Her preparation included Ironman Roth in Germany where she finished 8th for her debut in Kona. Then tragedy struck as she fell on cycle in the Cradle and broke her collar bone three weeks before Kona. She still went to support her friends which was a bitter sweet experience. “Up until race day it was really hard, but on race day it was a lot of fun to see the top athletes in the world racing and to support my friends”.